I hosted an Italian Family Sunday dinner recently and I made all sorts of yummy treats. My most famous dish is my carbonara, but that recipe remains secret! This time I wanted to make a homemade bread to serve with my carbonara. I had recently seen one of my favorite shows, Extra Virgin, on the cooking channel and remembered Gabriele making some delicious bread. The bread was called Schiacciata and it was an authentic Italian bread. I am so glad I tried this recipe out. The dough was the perfect pillowy texture. 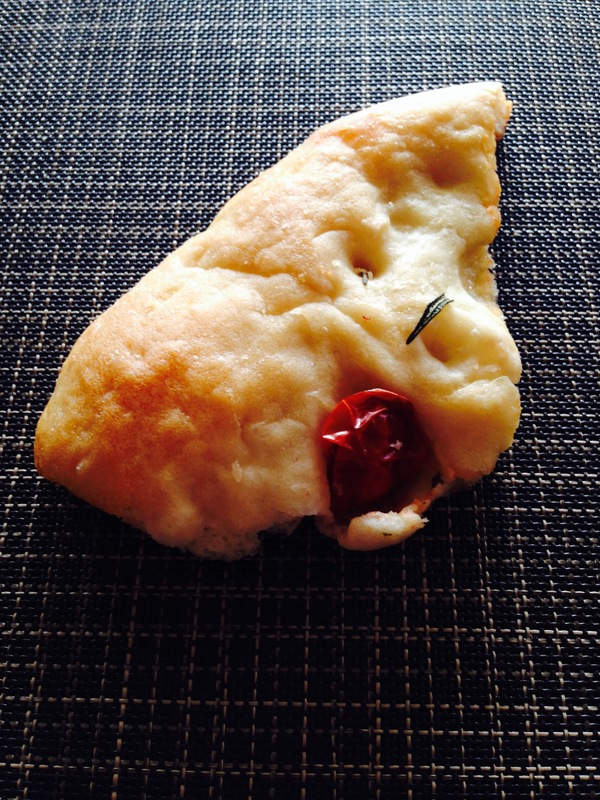 It was super easy to make and tasty with the fresh rosemary and cherry tomatoes. I think you could top it with all sorts of yummy combos, garlic and basil, thyme and shallots, whatever you like. It was crispy and the perfect paring to my homemade fettuicine carbonara. Cooks note: in a pinch I made this a second time with store bought pizza dough and it still turned out great! Measure the water in a measuring cup, stir in the yeast and let develop for 10 minutes. It should look foamy when it’s ready. Meanwhile, add the flour and kosher salt to the bowl of a stand mixer fitted with a dough hook. Turn on to whisk together and run for a minute or so to create a well. With the mixer running, add the water and yeast in a stream. Turn the mixer up to speed 2 and knead until the dough comes away from the bowl and it looks smooth and feels elastic but still sticky, 5 to 7 minutes. Flour your hands and knead the dough for a minute on the counter. Grease a large glass bowl with 2 tablespoons olive oil. Add the dough, flip on both sides and cover with a clean tea towel. Place the dough in a warm spot to rise until it is double in size, about 1 hour. Preheat the oven to 400 degrees F. Spread a half sheet tray with the remaining olive oil. 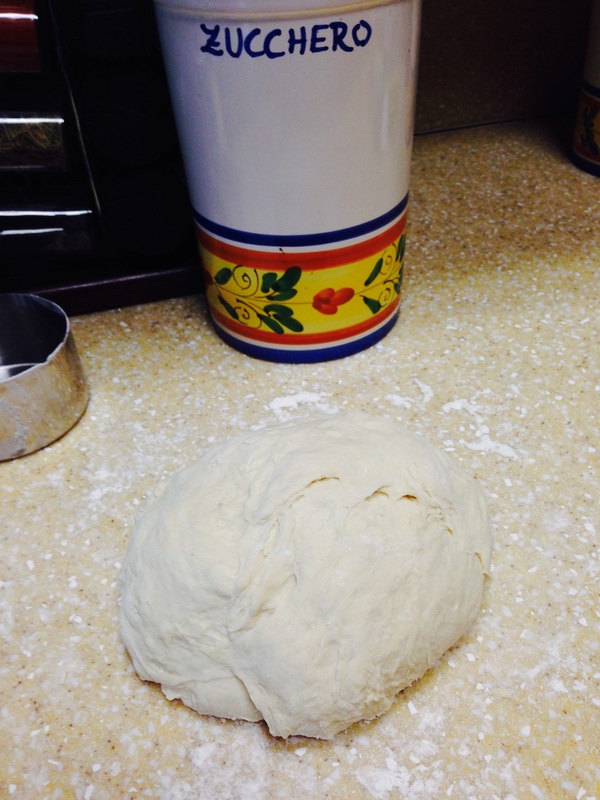 Lay the dough on top and stretch and pat out until it reaches 10-by-16-inches, an oval rough shape is ideal. Use your fingertips to press in small indentations. Sprinkle evenly with the cherry tomatoes, sea salt and rosemary leaves. Let rise again for 20 minutes. Place on the middle rack of the oven and bake until puffed and golden, 20 to 25 minutes. Slice into wedges or squares for serving and drizzle with more olive oil, if desired. My readers have seen my many posts on Sunday morning treats before. I recently saw a new recipe I just had to try. It was from a show that always has great recipes, the Chew. Also, these cinnamon rolls are from one of my favorite chefs, Mario Batali. Upon reading the ingredients I was a bit puzzled. The dough had white wine in it, hmm that sounds strange, I thought. I have never used wine in any doughs before, I wondered if it would come together. I have also never had a Mario Batali recipe that turned out bad so I figured what the heck. I had a nice bottle of chardonnay in fridge I use for cooking. The water and sugar amounts in the recipe were less than usual dough so I could see how the wine replaces those measurements. I have to tell you, when me and my gorgeous Italian sous chef mixed it together it smelled a bit funky. But after we added the flour and got the dough to come together it was the perfect texture and the smell of the wine and the yeast went away. After letting the dough rise, I knew this was going to be great, as the dough was so soft and fluffy. It was really easy to make it the recipe had one of my favorite criteria – I had all of the ingredients in the house (even before grocery day, and my cabinets were pretty bare). The only thing I tweaked was using my mom’s confectionary sugar glaze, instead of Mario’s version. So if you want to whip up some fresh cinnamon rolls for a sweet Sunday treat, these rolls are a great new version to try. To Make the Dough: Combine the Wine, Water and Yeast in a large bowl and stir until dissolved. Add the Honey, Salt and the Olive Oil and mix thoroughly. Add 1 cup of the Flour and mix with a wooden spoon to make a loose batter. Add 2 more cups of the Flour and stir with the spoon for 2 to 3 minutes to incorporate as much flour as possible. Bring the dough together by hand and turn out onto a floured board or marble surface. Knead for 6 to 8 minutes, until you have made a smooth firm dough. Place the dough in a lightly oiled bowl and cover with a towel. Set aside to rise in the warmest part of the kitchen for 45 minutes. For Assembling the Cinnamon Rolls: Preheat oven to 375° F. Butter a small cake pan and set aside. On a clean floured surface, roll out the dough using a rolling pin. When the dough is an 1/8 inch thick, pour the Melted Butter generously on top, spreading evenly. Evenly sprinkle the Sugar and Cinnamon over the Melted Butter. Carefully roll the dough, working away from you. Using a chef’s knife, cut the dough into even slices, about one to two inches thick. Arrange the slices in the cake pan to fill pan as much as possible, with the edges of the rolls in contact with each other. Bake for about 40 minutes, or until deep golden brown. To Make the Glaze: While the rolls are baking, prepare the icing by placing Powdered Sugar in a bowl. Pour the warm water into the Sugar and whisk until smooth. Adjust the Sugar and Water until desired consistency has been reached. Add zest and stir to combine. 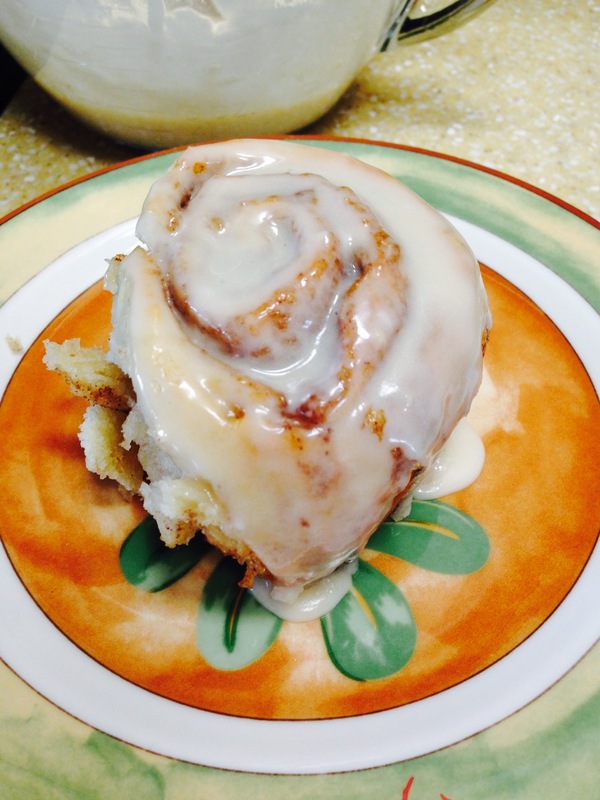 Drizzle glaze over rolls to serve. *Cooks note: My mom’s glaze is confectionary sugar, vanilla extract, milk and butter. I eyeball it but I would say it is: 2 Cups confectionary sugar, 1 tsp vanilla, 1 Tbs milk and 1 Tbs butter, can add more milk as needed to thin out frosting. I use this anytime I need a glaze. Eastern versus western is always an ongoing battle in our world. Whether it is BBQ or burger places, each coast always thinks theirs is the best. I have been lucky enough to live on both coasts which has given me the chance to sample many culinary delights. I am a yankee by birth and proud of it. On the east coast my favorite sweet treat is called a black moon or a moon pie. After living out west for the last few years I have found they are called whoopee pies out here. I always get a strange look when I say I am bringing a black moon to a party in CA. 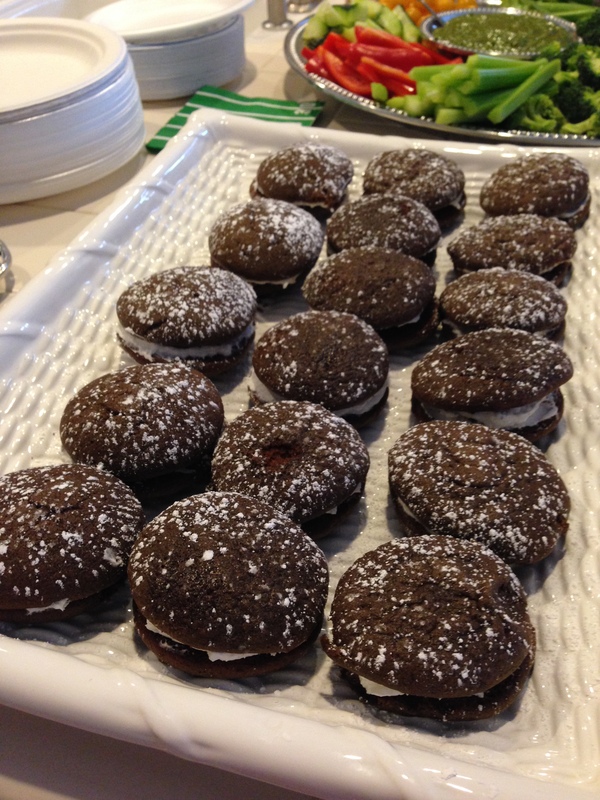 But I know if I was home in New Hampshah and said I had whoopee pies for dessert, I might get a funny look. However you like to say it, moon pies are a real treat. The moist chocolate cake made into a sandwich with fluff (another thing west coast people usually do not know about) frosting to glue it together; can you think of a better marriage? When I have seen these heavenly little pies at bakeries, they are upwards of $5! You can make them very cheaply and then you don’t have to eat just one. Another fun thing is to make mini “slider” versions or just go for it and make a few large ones, with the same batch of batter and frosting. This is my mom’s recipe (thanks Mahgee), not sure where she got it, but this is the only time my friends and family get excited for me to break out my moons. 1. Beat crisco, egg, sugar and vanilla. 2. Mix dry ingredients and then add to wet alternatively with milk. 4. Bake at 425 degrees for 9-10 mins, check oven temp and watch those suckers, they burn fast. Mine were done in 8! A few got a bit dark on the underside edge, I used a zester to remove the darker spots, a very handy tool to keep you from throwing away stuff that baked a bit too long in spots. 1. mix crisco, confectionary sugar, vanilla, and fluff in stand mixer. Dilute with teaspoon or more of milk if needed, to get to nice thick spreadable frosting consistency. Frost one half of moon and stick second half on top. Dust with confectionary sugar from sifter to make a pretty treat. Makes around 1 dozen whoopie pies, depending on size. I know I am all about natural and I rarely use crisco in my recipes, but I have tried this recipe with butter and it is not the same, so it is ok to break out the crisco once and a while. 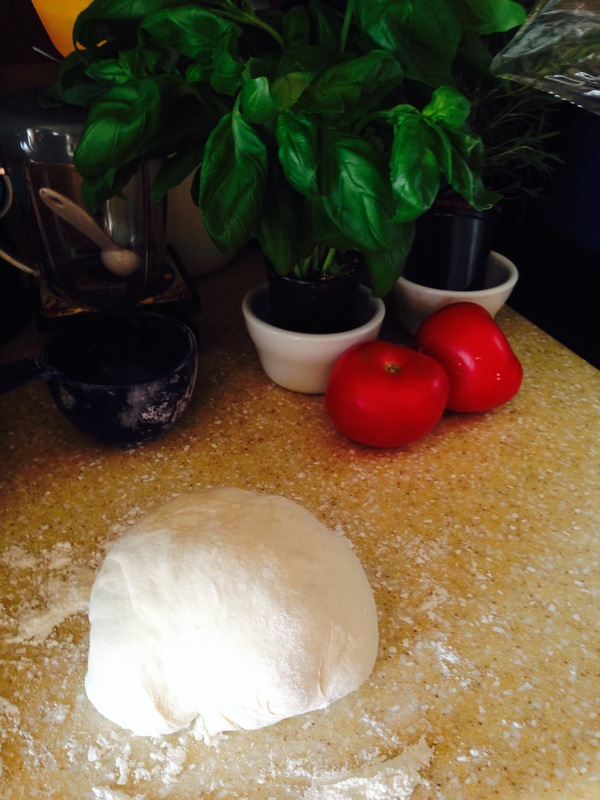 You are currently browsing the What Tara's Cookin' blog archives for February, 2014.